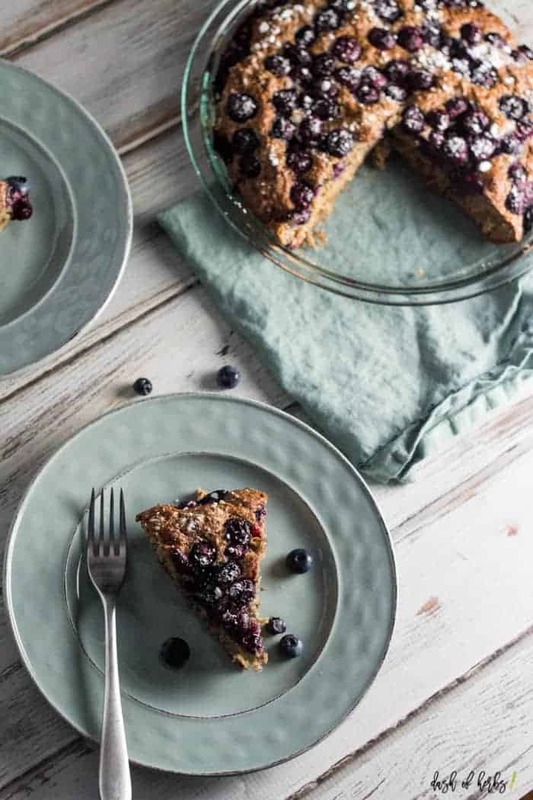 Start your day off right with this amazing blueberry coffee cake for breakfast. 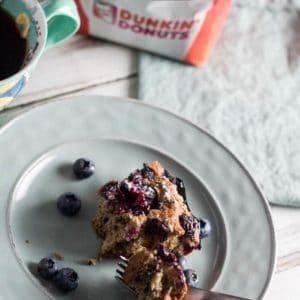 This recipe pairs perfectly with any kind of coffee, but in my case that would be Dunkin’ Donuts®. Nothing screams summer to me more than fresh blueberries. The sweetness, the cold burst of flavor and even the tough skin makes them one of my favorite spring/summer fruits. 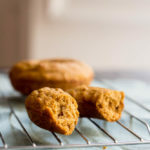 And they are so easy to pop into your mouth for a quick and easy snack. 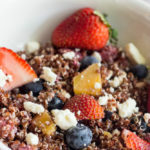 I used to always have fresh blueberries in my snack bag and I would add them to my vanilla yogurt, to add a bit of texture and added flavor to my afternoon snack. Have you ever tried that before? It’s amazing. 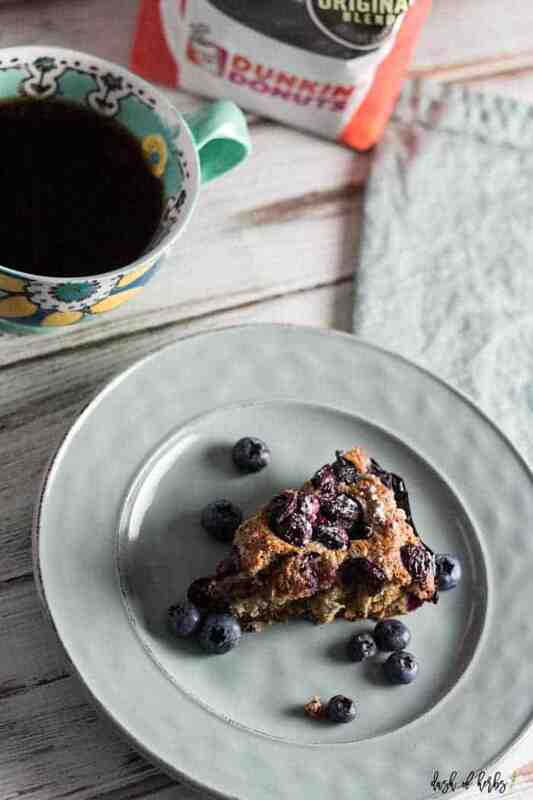 Besides this amazing blueberry coffee cake, can we talk about coffee for a minute. I recently made the switch from other coffees (I buy the giant economy tubs) to Dunkin Donuts coffee and I have no idea why I waited this long to make the switch. 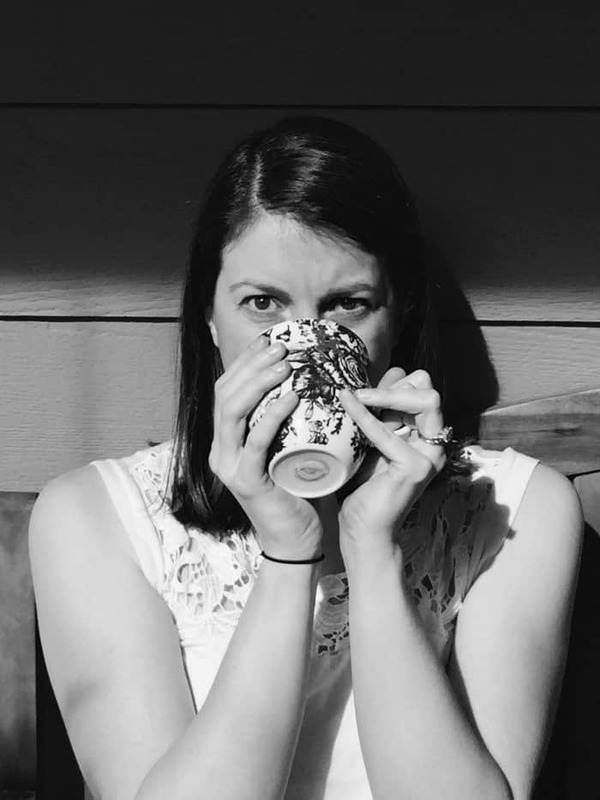 The Dunkin Donuts coffee that I bought from Publix is so much more full-bodied than the other coffees and the flavor lasts longer – although the brewed coffee does not last nearly as long because it’s so tasty. Dunkin’ Donuts offers many varieties, flavors and forms (K-Cup or Grounds). I chose the original blend in grounds, but I saw so many other options that you could choose from. The options at Publix are endless to enjoy this full-bodied coffee. 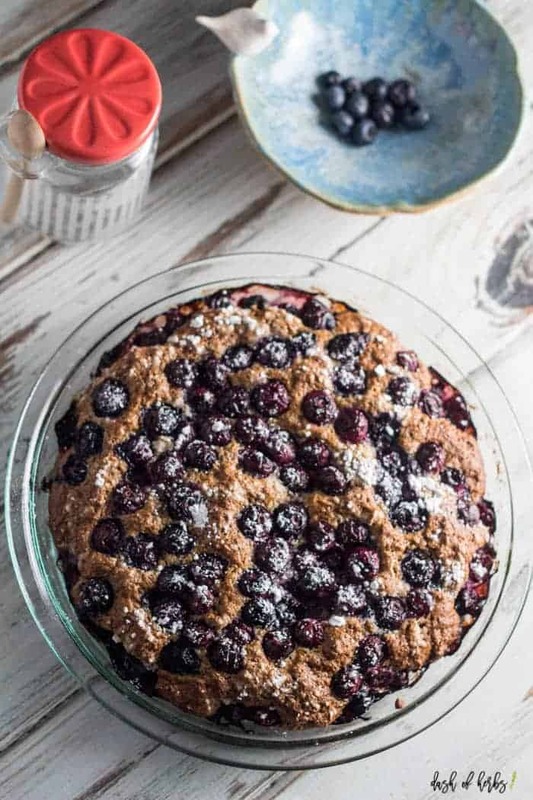 If we were to sit down and enjoy a blueberry coffee cake and a cup of coffee together, I would tell you that I am insanely grateful to have my life back. Weight Watchers has changed my life and made me love to cook. I realize that this is a skill, but it’s a skill that anyone can learn if they know the basics. I would also tell you that I am loving my 30’s. It’s been some of the best years of my life so far and I can’t wait to see what the future holds. In a medium bowl, mix together the dry ingredients. In a small bowl, mix together the egg, Light and Fit Greek yogurt, olive oil, and vanilla. Mix the wet ingredients into the dry ingredients. Spray a round baking dish with cooking spray. Add the batter and spread evenly throughout the baking dish. Add the blueberries to the top of the batter. Top with the powdered sugar. Place the dish in the oven and bake for about 50 minutes. Cut into 8 slices and serve immediately. 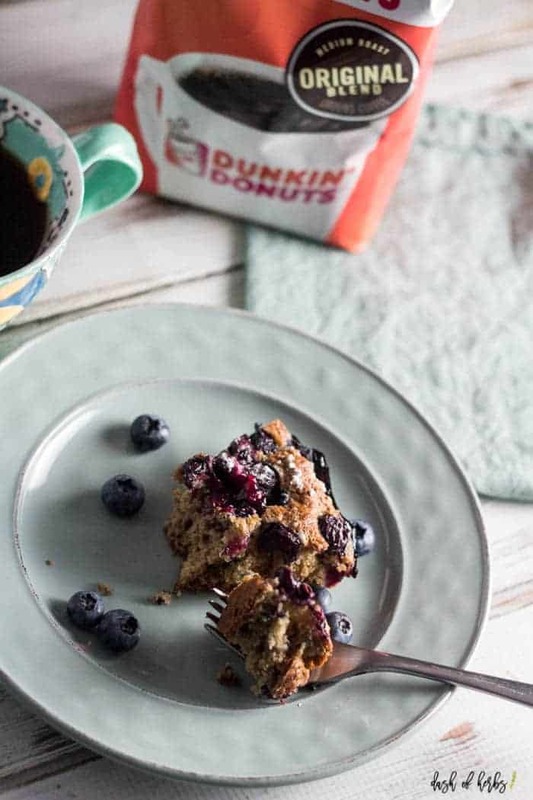 Don’t forget to enjoy this coffee cake with a cup of delicious Dunkin Donuts coffee. And just for you! Take advantage of $1.00 off any ONE (1) Dunkin’ Donuts varieties now through 5/6/17 at your local Publix, while supplies last. 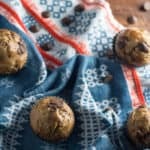 This recipe is 5 Freestyle points per serving, 1 slice. Do you mean the blueberry container? You can do either a small one or a larger one depending on how many blueberries you want in your cake. How much is a carton, weightsize? 8 oz?